Inga Rehmann is the Interior Design Director at Oz Architects, an architecture and design studio based in Scottsdale AZ. Their recent venture is an LA pop-up/ concept shop with Oz’s Owner and Principal architect - Don Ziebell, OZ|SHOP. Hi, Inga. OZ Seems like an amazing place. Can you give us an idea of what your day is like? 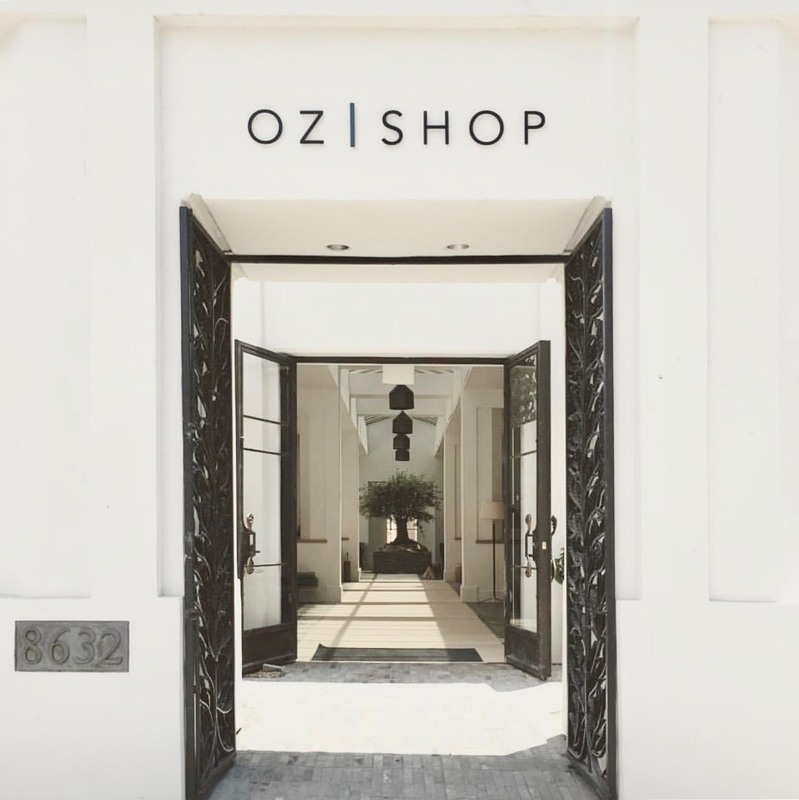 Recently, my days have involved working the floor in our recently opened concept “pop-up” shop on Melrose Ave, OZ|SHOP, where we have loved meeting and assisting the wonderful design community from LA and beyond. Our selections range from OZ|SHOP’s own line of benchmade furnishings and accessories to our curated collection of antique and mid-century finds. However, a “normal” day for me changes often from being in the office brainstorming concepts, sketching and drafting, to walking the job site during construction, to traveling with clients in Europe to source building materials and furniture, to placing furniture and accessories in a home during an installation. One might say we wear many hats, but I would say we wear many shoes! Have you always been into interiors? What brought you to OZ? While I did have an affinity for re-arranging the furniture in our house and designing rooms with the cut-outs from a Sears catalog as a child, my path to becoming an interior designer (and primarily a residential designer) was not direct. After training as an accountant for a few years in Montana, I found my way back to Interior Design in Arizona. Originally wanting to focus on hospitality and retail design, the moment I walked into an Oz Architects designed residence I knew this was where I wanted to work and the type of design I wanted to be involved with. The house I had visited early in my days at Oz already felt like a home, even before any furnishings or soft goods were installed. The sense of soul the home had was obvious. I wanted to be part of something that was that meaningful and contribute to creating these kinds of spaces for our clients in the same way. Hard to believe that was 10 years ago this week. but I would say we wear many shoes! Great Question! OZ|SHOP, our “pop-up” concept shop is the result of approximately 40% dreaming, 10% planning and 50% a leap of faith! With Oz Architects, we are currently working on a large remodel project in Bel-Air that has us in LA for an extended period of time. Over the years we have collected and found some amazing furnishings and objects in our travels to Europe (Our sister company, Antiquities, imports building materials and reclaimed objects from Europe) and were looking for the right outlet to showcase them. In addition, Don Ziebell, Owner and Principal Architect, has been designing a line of furnishings and accessories made from the various materials we bring in (antique oak beams from France, French limestone blocks, slabs of tropical hardwood, steel, etc). We have two master woodworkers in our workshop that allow our ideas go from napkin sketch to reality. Giving new life to old objects and using rustic materials in modern ways, is something we are drawn to, in the designs we do both in projects and in our furniture line. Who's doing really exciting things in your industry? I love how people all around us are branching out of just one specific area and taking a more holistic approach to design - expanding their ideas into furniture design, hardware design, interior and architectural design, art, and exterior spaces. I see this happening with artists, architects, exterior designers, interior designers and fashion designers alike. It is a very European approach, and one we strive to reach for in our own companies and in our own designs. Simultaneously, all the collaborations we see between designers and companies around us today are equally as inspiring. The combined power of two creative groups and the outward appreciation of what others are creating at the same time is fantastic, and inspiring. And especially necessary expressions of support of creativity, ingenuity, and respect in today’s world. I’m currently loving Jenni Kayne and the brand (fashion and home) she has created for women, to empower women, and to bring simple beauty to all aspects of our daily lives. She recently offered a series of workshops inspiring and empowering women at her shop in West Hollywood and has just launched a bedding / linen collection in collaboration with Parachute Home’s creator Ariel Kaye. The people around us that do good in this world, that bring joy and kindness to others, that honor their own truth, that empower us to be our best selves through hardship and ease, and that work daily from a place of love, light, and respect. While I don’t always know their names, they are the people that inspire me and I call heroes. What makes up a perfect day for you? A “Verve” chai and pastry, marine layer clouds, fresh air and a cool breeze, creative inspirations, a combo of a good candle and good music, sunsets, laughter, a cozy fire, a glass of wine and a good book or magazine. Got any advice to younger self? Don’t be so anxious to grow up! Take more time to explore and be creative.